There is so much more to Chicago than the insatiable wind! Educational and entertaining opportunities are practically endless in Chicago, which makes it the ideal student travel destination. Science. When students think of educational tours, they often think of scientific museums. While that can be accurate, they often underestimate how interesting and exciting these locations can be. Chicago excels at making science fun and accessible to students. Some of the most popular science oriented destinations in Chicago include: The Field Museum, the Museum of Science and Industry, the Brookfield or Lincoln Park Zoo, Shedd Aquarium, Adler Planetarium, or the Pegge Notebaert Nature Museum! Performing Arts. Chicago would be an ideal destination for your theater, music, or dance group because Chicago offers it all. While on a school trip, you could view several performances and request an inside perspective on what it looks like to be a professional musician, dancer, or stage actor. The following list barely scratches the surface of all that Chicago has to offer in these areas: Chicago Symphony Orchestra, the Harris Theater for Music and Dance, Lyric Opera of Chicago, Goodman Theater, Lookingglass Theater, Shakespeare Theater, Steppenwolf Theater Company, Joffrey Ballet and the Broadway Playhouse! Visual Art. By visiting Chicago, you won’t just get access to one premier art museum. Chicago has several excellent art museums that cover every range and style of art including: The Art Institute of Chicago, The Museum of Contemporary Art, DuSable Museum of African American History and the National Museum of Mexican Art. History. Chicago itself has a rich and exciting history that permeates every part of the city. The Chicago History Museum was recently revitalized and is now a thriving location for learning about Chicago’s past, present, and future. But you won’t just learn about Chicago’s history at the museum. You’re guaranteed to experience Chicago history while visiting any of the other destinations included in this post. Architecture. Chicago has some of the most notable architecture of all U.S. cities. Both old and new architecture offer aesthetic learning opportunities. You can experience the amazing architecture simply by exploring the downtown areas, by taking advantage of opportunities to view the Chicago skyline, or by purposefully making it a part of the educational experience. The Frank Lloyd Write home and studio are both located in Chicago as well as several homes and buildings of his design. There are at least 10 different tours that highlight a different element of Wright’s architecture. Furthermore, The Chicago Architecture Foundation offers a plethora of tours, lectures, exhibits and special events. Cultures. Chicago has been dubbed the “City of Neighborhoods.” This is because it is comprised of several neighborhoods, each with its own culture and history. Some of the international cultures represented in Chicago neighborhoods include: Swedish, Italian, Indian, and Pakistani traditions. Food. One more thing Chicago is known for is food. Chicago restaurants that specialize in gourmet food have won many prestigious awards. The rich cultural background also offers a variety of eating experiences. But students may be most interested in the famous Chicago style deep-dish pizza pies. It’s a must for any school trip to Chicago. Test out several different pizza restaurants to determine which offers the best Chicago style pizza. Sports. Add an entertaining element to your school trip by including the Chicago Sports Museum and a professional sporting event. Whether it’s Bulls’ basketball, Bears’ football, or Blackhawks’ hockey, a sporting event will be a crowd pleaser. Aside from all of the opportunities listed above, Chicago also offers an endless number of tours, events, and festivals. It doesn’t matter when you decide to visit, there’s bound to be an event or festival that will put your school trip over the top. Students will love the Segway and boat tours. And don’t forget to make time to simply explore Navy Pier, Millennium Park, and other iconic areas of Chicago. Finally, it would be smart to look into the Chicago City Pass and the Go Chicago card to make your school trip more affordable. 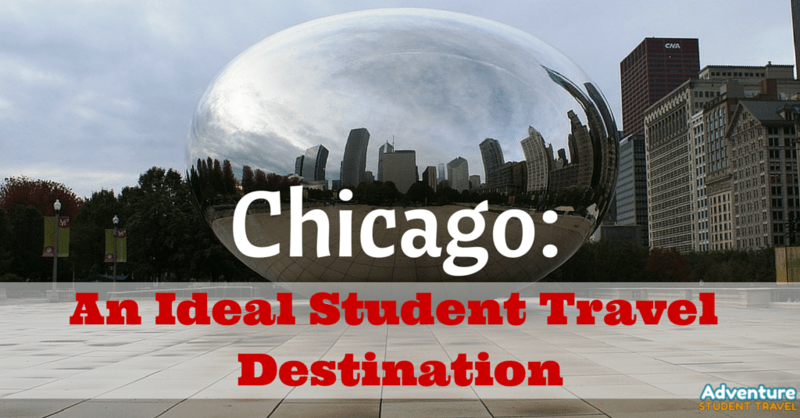 Decide to make Chicago your student travel destination and your trip will not only be educational and entertaining but it will inevitably keep students happy.